Iceland is well-known as a photographer's paradise due to the great variety of landscapes—from glacial lagoons to waterfalls and black sand beaches. During the summer months the combination of the low angle of the sun and prolonged sunsets allows for hours of shooting in perfect light. The most dramatic light often occurs around 9:30-10:00 pm and we will take advantage of this when it looks like a colorful sunset will take place. The main focus of this tour will be landscape photography, but we will also be on the lookout for the smart and beautiful puffins as they nest on vertical cliffs along the seashore. On this visit to Iceland we will circumnavigate the island in a clockwise direction. Departing from Reykjavik we begin by exploring and photographing the Snaefellsnes Peninsula to the west, with the spectacular Kirkjufellfoss Waterfall shown above and on the cover. 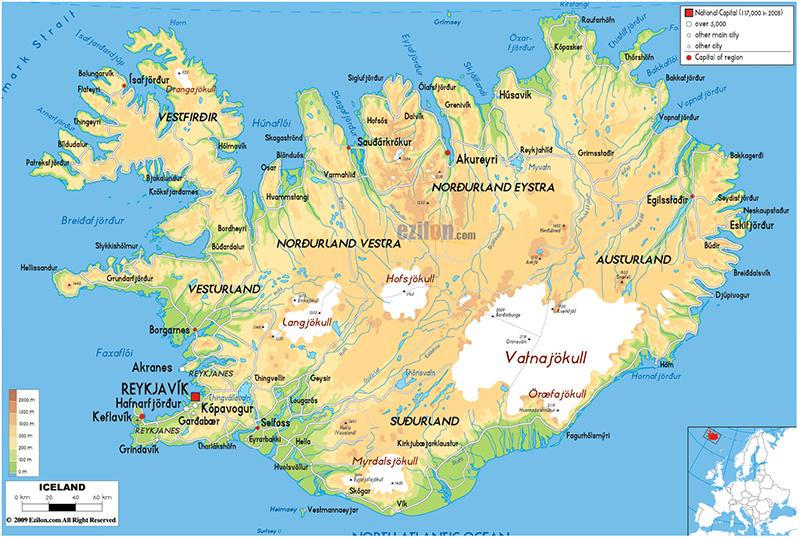 We will then drive to the more remote Vatnsnes Peninsula in the north-west before heading east to Lake Myvatn. From there we will continue to the east coast to the beautiful glacial lagoons and icebergs. Our route back to Reykjavik will take us along the stunning south coast, which is sprinkled with waterfalls, basalt columns and black sand beaches. Travel will be in a large, comfortable bus where each person will have two seats, and along the way we will enjoy excellent meals and lodging. We will also have the benefit of a personable local photographer-guide to take us to the best locations at the best time of day. You will land at Keflavik International Airport and transfer to your hotel in Reykjavik, where you can relax before the exciting upcoming tour. We’ll meet at 7 PM in the lobby of the hotel and go out for dinner, where we will get to know each other and discuss our itinerary and the exciting journey ahead of us. Check WOW Airlines for direct flights to Iceland. If you want to arrive a day early to enjoy Reykjavík, please let us know and we will arrange accommodation. Transportation to the hotel will be provided on the Flybus, which leaves from the airport and drops you off in front of the hotel. Passes for the Flybus are included and will be emailed shortly before departure. Accommodation in Reykjavik. We will have an early pick-up from our hotel in Reykjavík and begin our journey by traveling to the southern part of Snæfellsnes to see and photograph the rugged coastline of the peninsula. This area includes the columnar basalt cliffs Arnarstapi and the windswept area of Budir with its beautiful pitch-black church and cemetery. In the evening we will photograph the Kirkjufellsfoss waterfall at sunset. Accommodation in Snæfellsnes at Hof Snaefellsnes Hotel. The coastline of Snæfellsnes is dotted with small villages within a short distance of each other. The north and south coasts are divided by rugged mountains and the mysterious Snæfellsjökull glacier. Today we will remain in Snæfellsnes because there are so many picturesque places to visit. We will travel to several new locations and explore the northern part of the peninsula as well. The highlight of the northern area is the mountain Kirkjufell, with its dramatic formations and unique shape. Kirkjufell is reputed to be one of the most beautiful mountains in the country and is without a doubt very striking with Kirkjufellsfoss waterfalls in the foreground. Accommodation in Snæfellsnes at Hof Snaefellsnes Hotel. After breakfast we will depart for northern Iceland and visit the wild and remote Vatnsnes Peninsula. This area is known for its vast and partly uninhabited terrain with an intermingling of craggy hills and green pastures where Icelandic ponies can be seen. The Vatnsnes Peninsula is known as a seal breeding ground and is an excellent area to see the seals in their natural habitat. They are quite curious, enabling us to get very close to them. We will continue to explore the area surrounding Myvatn as there is much to see and photograph in this locale. We will travel north to Jamafjall, an area covered with colorful hot springs and mud pools. This scenery gives us a glimpse into what the earth may have been like when it was first formed. We will also visit Krafla, a volcanic caldera about 10 km in diameter, which includes the Viti Crater with its green lake. Viti means "hell" and in former times people believed that hell was under these volcanoes. We will also visit the striking waterfall, Godafoss, which means "Fall of The Gods". Then we will go to the Aldeyjarfoss Waterfall, which tumbles into a wide basin surrounded by extremely beautiful basalt columnar walls. Since the nights are often colorful and the sun never fully sets, we will try to capture these locations in the evening when the sky is the most dramatic and colorful. Accommodation In Myvatn area at Reynihlio Hotel. Before we head east we will visit Jokulsargljufur National Park to see Dettifoss, Europe's most powerful waterfall. Dettifoss is 100 meters wide and drops 45 meters, giving you and unforgettable experience of feeling so small compared to the massive volume of plummeting water and plume of spray, which can be seen from a kilometer away. From here we will have a pretty long drive over the highland desert area, through a mountain pass and into the beautiful Eastfjords. Our destination is the Vatnajökull Glacier, Europe's largest glacier and a national park. The landscape along the eastern coast is strikingly beautiful with many deep fjords, picturesque fishing villages, highland farms and waterfalls. We will spend the night in the small seaside town or Djupivogur, with its charming harbor and well-preserved old buildings. Accommodation at Eastfjord at Framtio Hotel. From Djúpivogur our journey continues south to the Jokulsarlon Glacial Lagoon, where we will spend two nights in the area of the Vatnajökull National Park. This large park encompasses the glacial lagoon at Skaftafell in the southwest to the Jokulsargljufur Canyon in the north. Few other places in the world offer such a wide range of natural wonders as Vatnajökull and we will explore and photograph a variety of glaciers and glacial outlets. These huge glaciers are constantly calving, resulting in large, floating blue icebergs that turn and spin on their way to the sea. These translucent icebergs then wash ashore onto the black sand beaches as the tide recedes, and at sunset they sparkle like diamonds. Accommodation at Vatnajökull, Hotel Hali. In addition to the glacial lagoons we will have an opportunity to visit the black sand beach at Stokksnes with the majestic peak of Mt. Vestrahorn. This dramatic mountain makes a wonderful backdrop to the rugged beach. Svartifoss Waterfall, or the black waterfall, is also very dramatic and nearby. This area offers numerous exciting locations and we will visit as many as time allows. Accommodation at Vatnajökull, Hotel Hali. Today we will leave Vatnajökull National Park for the short and scenic drive along the south coast to the charming village of Vik. The southern coast of Iceland offers some of the most stunning natural attractions on the island, with a mix of volcanoes, lava fields, glaciers, wild black beaches, epic cliffs and sea stacks and iconic waterfalls. There will also be an opportunity to photograph puffins if they are at home in the Dyrholaey Cape. On the way to Vik we will stop at the moss covered lava field at Eldhraun. Here the lava is completely covered with a soft moss, creating unexpected smooth rolling mounds. The black sand beach at Vik is also a magic location and includes the large Reynisdrangar basalt sea stacks. Nearby is the black beach at Reynisfjara, which offers massive basalt columnar walls and caves. This beach has been rated as the most beautiful non-tropical beach in the world. Accommodation in Puffin Hotel, Vik. Today we will depart Vik and return to Reykjavik, but on the way there are many wonderful places to visit and photograph. We will stop at the Dyrholaey Promontory to see the columns of Reynisdrangar and more black cliffs and sea stacks. There is also a large black arch formed by the lava, which gives this peninsula its name. These cliffs are home to Atlantic puffins and we will take time to photograph them again. Further along we will visit two well-known waterfalls: Seljalandsfoss and Skogafoss with a drop of 60 meters. We will also pass by two active volcanoes--Hekla, a 1490 meter high snow-capped mountain where devastating eruptions earned it the name, "Gateway to Hell" and the famous Eyjafjallajokull, the flight-stopping volcano from 2010. This evening we will have our farewell dinner at a restaurant in Reykjavik and share our lasting memories and friendships. Accommodation in Reykjavik. Accommodation at Kea Storm Hotel. The total price of the Iceland Tour is $6800 per person, double occupancy. Single supplement is $875. A $1,000 non-refundable deposit is due with registration. Payment in full is due 75 days prior to departure--May 1, 2017. A recommended packing list will be sent prior to departure. Two professional photography guides, including a local Icelandic guide. Photographic assistance will be offered and readily available. Transportation in a spacious and comfortable bus with ample room for photography gear. Each person has two seats. All accommodations in hotels and guesthouses with quiet rooms and private bathrooms. Please note that some hotel reservations may change. "Traveling on a photographic journey with Doug Steakley is always incredibly enlightening and fulfilling! He is a kind and patient teacher no matter what your level or what camera and equipment you own. The opportunity to travel to a country with someone like Doug who pays attention to the details and carefully selects the contacts and the locations in country is invaluable. Iceland is absolutely gorgeous and a joy to photograph. Thank you Doug!" "Our trip to Iceland was a great experience. The geography is dramatically different from anything we have seen. It was a landscape photographer’s paradise. All the facilities were perfectly fine, food was great, and service friendly and efficient. We are very glad we went, and we enjoyed being with our fellow travelers."